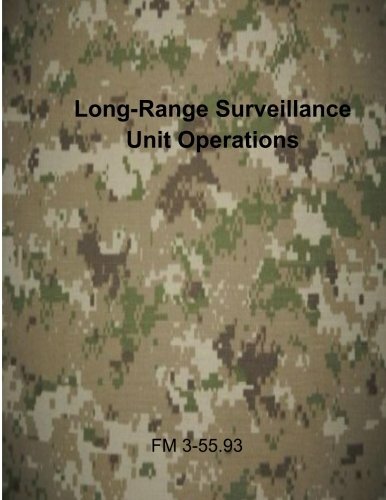 This manual is primarily written for US Army long-range surveillance units (LRSU) and other Infantry reconnaissance and surveillance (R&S) units. It is also provided for use by corps, division, brigade combat team (BCT); battlefield surveillance brigade (BFSB); and reconnaissance and surveillance squadron commanders and staffs; instructors of US Army corps, division, and BCT intelligence, surveillance and reconnaissance (ISR) operations. In addition, many of the subjects covered should be a ready and useful reference for other branches of the US Army and US military, and for multinational forces working in a joint environment. This manual defines the organization, roles, operational requirements, mission tasks, battlefield functions, and command and control (C2) relationships of LRSCs organic to the R&S squadron of the BFSB. It also provides the doctrine for LRSU to use in combat training and combat. It establishes a common base of tactical knowledge from which leaders can develop specific solutions to LRSU tactical problems. It increases the effectiveness of LRSU operations by also providing doctrinal principles and selected battlefield-proven tactics, techniques, and procedures (TTPs). The Digital Training Management System (DTMS) contains the LRSC combined arms training strategies (CATS) and collective tasks for training the LRSU. Before leaders can use this manual to develop and execute training for, and to plan, coordinate, and execute LRS missions, they must first know FM 3-21.8, Infantry Rifle Platoon and Squad, and LRSC CATS.